This year, BCNA celebrates its 20th anniversary. What an achievement for an organisation that was the brainchild of one woman – Lyn Swinburne – and began at her kitchen table in suburban Melbourne. We know that over those 20 years there have been great improvements in treatment and care for breast cancer – our experts explained some of them in the Now and Then article in the last edition of The Beacon. Here at BCNA we decided back in 2016 that we wanted to investigate how far treatment and care has come in 20 years of consumer advocacy, and where the gaps are for people diagnosed with breast cancer today. So began an 18-month project to gather the experiences of our members – good and bad. This project became the biggest Australian study of its kind – we collected more than 15,000 individual experiences from right across Australia. Thank you if you contributed. You may have completed our 2017 Member Survey or our earlier survey on the out-of-pocket costs of breast cancer treatment and care. You may be one of the 3,500 women and men who attended a face-to-face consultation with our now CEO, Kirsten Pilatti. Kirsten visited every state and territory to conduct these consultations and felt it was a great privilege for her to meet so many of our members and hear their stories. Women being told of their diagnosis over the phone, sometimes in the car with the phone on loudspeaker and the kids in the back seat. Women facing unexpected – and sometimes large – bills for treatment, including women who had been paying private health insurance premiums for years and expected their insurance would cover them when they needed it. Women experiencing disparities in care, especially if living in a rural area. Women feeling isolated and alone at the end of their treatment – doctors sent them back to their lives and the family celebrated by handing back the vacuum cleaner and expecting everything to get back to normal. Women with metastatic disease not having access to a breast care nurse or cancer coordinator. The findings from our project have been incorporated into a major report that was launched by the federal Minister for Health, the Hon. Greg Hunt, at a reception at Canberra’s Parliament House on 20 June. In response to the report, the Minister made a number of commitments to better support people with breast cancer. Shadow Minister for Health, the Hon. Catherine King, also spoke at the launch and reaffirmed the Opposition’s support for people with breast cancer, especially those with metastatic disease. We were delighted that BCNA member Emily, diagnosed with breast cancer at the age of 26, accepted our invitation to speak at the launch and share her personal experiences with those present, including Members of Parliament and BCNA corporate sponsors. Read Emily’s story here. We were also thrilled that a number of our ACT community champions were able to attend and speak with parliamentarians about their own experiences. Some of these women have been with BCNA since the very beginning, while others are only newly diagnosed and have more recent stories to share. The State of the Nation report identifies a number of positive changes over the last 20 years and it is important that we celebrate these. They include that Australia has one of the best survival rates for early breast cancer in the world, with the chance of surviving five years now 90 per cent. This gives women newly diagnosed with early breast cancer great hope. additional challenges for some groups, including young women, men and Aboriginal and Torres Strait Islander women. We make recommendations for urgent action in eight key areas. These eight priorities now form the backbone of BCNA’s advocacy work. As well as these national priorities, the State of the Nation report outlines issues of concern on a state-by-state basis. We want to acknowledge the eight women who very generously shared their personal stories, and their photographs, as case studies for this report – Keira, Alysia, Sarah, Claire, Raffaella, Elaine, Ann and Andi. Five of these stories are used in the report to show how the challenges we have identified affect real people. We are pleased that during our State of the Nation journey, we were able to help with some local issues that members told us about. At a consultation in Broken Hill for instance, women told us it was difficult to meet with the breast care nurse because her office was in a hangar at the local airfield and, for safety reasons, the public is not allowed to enter that space. We contacted the local health service and are helping to find a new office for the nurse. In Cairns, women told us they had virtually no access to breast reconstruction surgery at the public hospital because of long waiting lists. Following BCNA’s intervention, a weekend clinic was held with surgeons flown to Cairns from Brisbane to assess women for surgery. While this issue is still not fully resolved, we continue to work with Queensland Health to help eligible women receive reconstruction surgery and to find solutions for a future referral pathway. 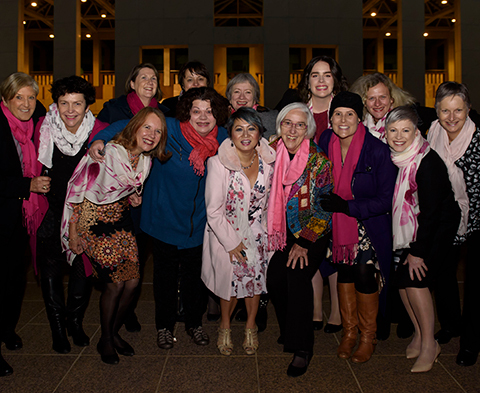 BCNA is very proud of this report, which has been sent to all members of the Federal Parliament, all state and territory health and shadow health ministers, and others involved in breast cancer treatment and care. Now the real work begins, as we work with governments and health services to address the gaps that we have identified. You can download the State of the Nation report and read about the launch and the commitments made by the Government and the Opposition on our website, bcna.org.au. We thank our partner Sussan for its financial support for this project.